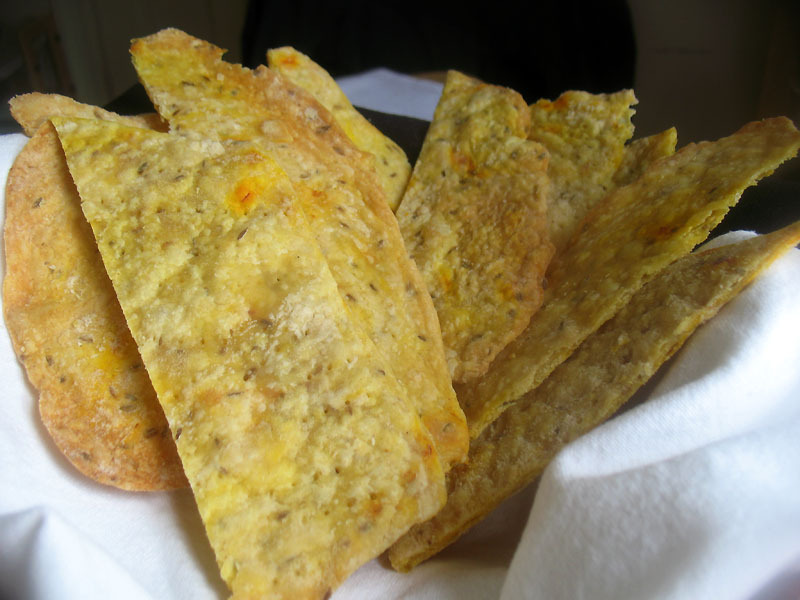 I've made crackers in the past, and they are not too difficult to make at all. The secret is to roll the cracker dough as thin as possible so that they come out crispy. 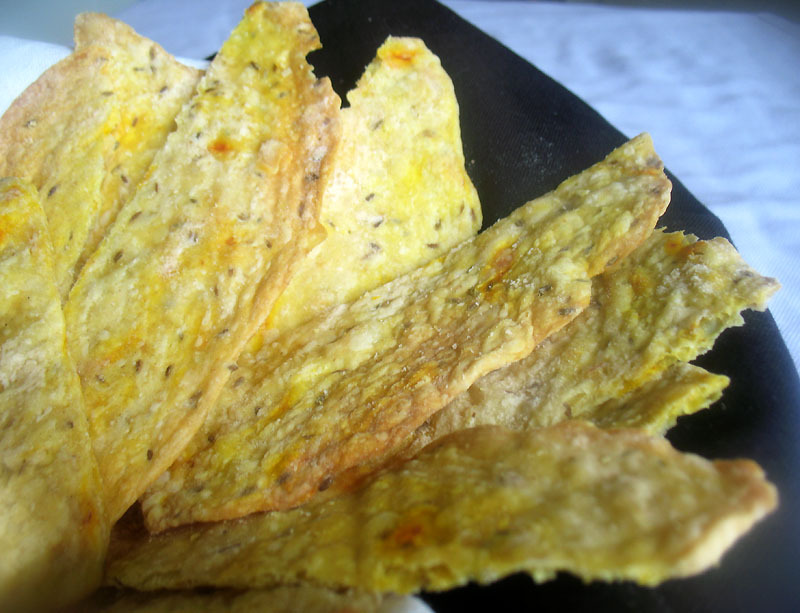 These colorful crackers are gently spiced with cumin seeds and saffron. Break them up to into pieces after they come out of the oven that are convenient for your purposes. These crackers are a special treat to serve along with a bowl of soup and make an ideal addition to an appetizer platter with favorite spreads, dips and sauces and other little nibbles, such as cheese and olives. 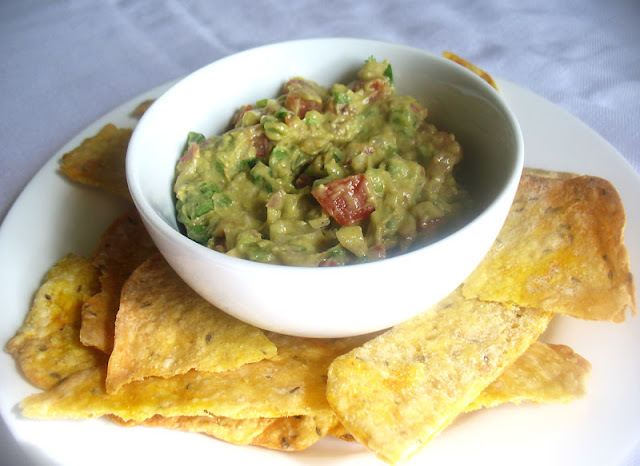 I made up a batch of homemade guacamole and I had plenty of crackers leftover too to enjoy for a couple of days afterwards. I thought that I had pretty much every kitchen tool or gadget I could think of ever using and then I discovered a silicone baking mat. These mats are inexpensive and perfect if you make dough for rolls, breads, biscuits, scones, pies, pizzas, pastries, or, in this case, dough to be shaped for crackers. You can buy larger versions for making pastries such as pie crusts or for larger breads and pizza. The great thing about these is they stick to the counter surface and you can brush with oil or sprinkle with flour for the kneading and rolling part and the cleanup is a snap. Just wash with soap and water and dry. For convenient storage, they can be rolled up and stashed away until you need to use it again. They can also be used for oven baking, so you don't need to line your baking pan with parchment paper or grease it when making cookies or pastries or any other thing you want to bake. I have two sizes now, because I'm totally sold on this handy kitchen idea. In a small bowl, combine the water with the saffron threads and let sit for 5 to 10 minutes. In a large bowl, whisk together the flour, cumin seeds and salt. Cut the butter into the flour in small pieces with a pastry cutter. Make a small well in the middle of the dry ingredients and gradually add the water and saffron, stirring gently until you have a soft dough but somewhat sticky dough. If the dough is too dry, add a little more water but if too wet, sprinkle in some extra flour a little at a time. On a lightly floured surface, shape the dough into a square shape about 1-inch thick. Wrap well with plastic wrap and refrigerate for at least 1 hour or overnight. Preheat an oven to 350°. Line two baking sheets with parchment paper. Turn the chilled dough out onto a lightly floured surface or a nonstick baking mat. Cut the dough into 8 pieces. Lightly flour a rolling pin and roll each piece of dough out as thinly as possible. Transfer to the prepared baking sheets and prick with a fork. Bake one tray at a time until golden brown and crisp, about 7 to 8 minutes. Make sure to keep a close eye as they tend to brown quickly on the edges. Repeat with the remaining sheet of crackers. Once baked, you can cut the crackers into smaller pieces with a pizza cutter while warm, or wait until they cool and break into pieces. Store in an airtight container at room temperature for a few days.